Our comics sales estimates for March 2018 are now online, and they find a new comic as the bestseller of the year — at least until Action #1000 comes along in April with its reported orders exceeding 500,000-copies. 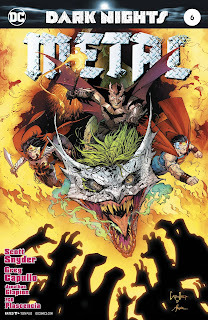 Dark Nights Metal #6 wrapped up that series with orders of more than 187,500 copies, more than any issue in the year so far. If you didn't see it last month, our year-to-date list now tabulates all comics and graphic novels reported in the year so far, fusing sales together when reorders are reported; the Top 100 for each category is listed. That chart finds January's Doomsday Clock #3 and Dark Nights Metal #5 from January in second for the year on strength of reorders — but it also shows a number of March-shipping comics ranked highly. 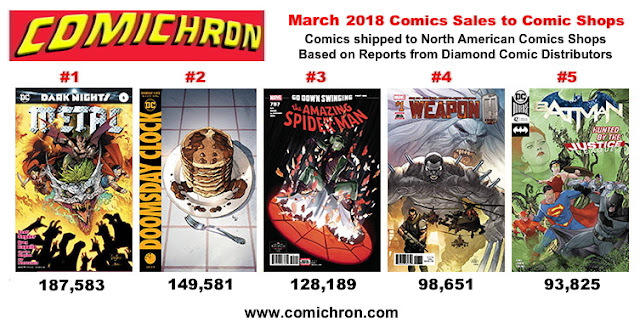 That corroborates the finding discussed here on Friday, which is that while a lot fewer new comics came out this March versus last March (which had one more shipping week), the comics that came out sold relatively better. The graphic novel shortfall was greater than what the smaller release slate would have predicted, however. Last March had extremely strong graphic novel orders, with both a new Saga and a new Walking Dead volume out. This March had only one of those — and the new Walking Dead Vol 29, while still the bestseller of the year so far, shipped 22% fewer copies than the March 2017 volume did. It's hard to know what portion of that comes from fewer ordering shops — whether because of closures or because they've shifted purchases outside of Diamond to other distributors — or whether the drop is related to the series itself. Twenty-two percent happens to also be the exact ratio by which graphic novel orders overall dropped in March, so at least this one data point correlates with the market's graphic novel sales overall. The graphic novel category presents a different competitive environment, with online retailers in play, as well as discount-house retailers (like Ollie's, earlier this year) selling either remaindered or liquidated trade paperbacks. While I've observed here several times that new comic book unit sales haven't been negatively impacted by digital sales, a recent controversy raises the question of whether graphic novel sales are more vulnerable. I think that requires further research, but the fact that bound collected editions aren't much of a factor in the aftermarket suggests that at least one of the things insulating print periodicals from defections to digital isn't as much in play for graphic novel buyers. One thing that wasn't as much in play in March: price. The average price of the Top 300 comics dropped to $3.82, the lowest it's been in several months. Be sure to follow Comichron on Twitter and Facebook.